Amazon yet again has brought another sale for its customers wherein the e-commerce giant is giving discounts and exchange offers on several smartphones. 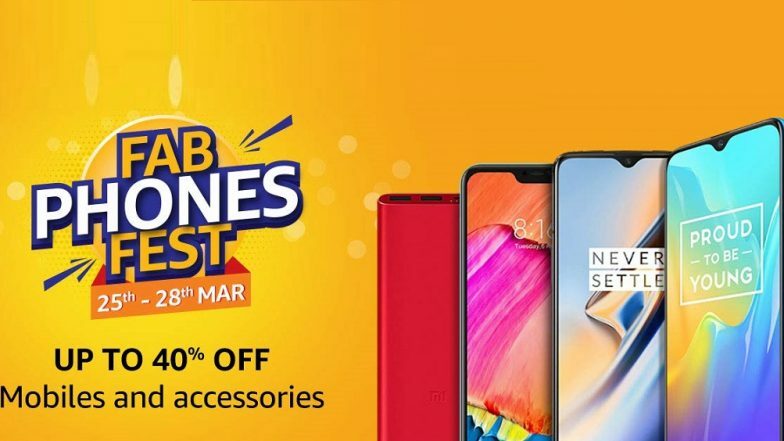 The Amazon Fab Phones Fest sale also attracts price cut on accessories like headphones, protective cases, power banks and much more. This 4-day sale from Amazon will conclude on March 28, 2019. It is an excellent opportunity for the customers looking to purchase a brand new smartphone. Some of the exciting deals of the sale are Vivo Y83 Pro, Huawei Y9 (2019) and Realme U1 that are offered at an attractive price points. The company is also offering no-cost EMI, exchange offers and other bank offers during the sale. Amazon’s Apple Fest Sale 2019 Offers: Discounts Up to Rs 17,000 on iPhone X, iPhone XR, Apple Watch, MacBook & iPad. As a part of the sale, the marketplace is offering lucrative discount of Rs 2000 on the Realme U1 smartphone, which can be bought at price point of Rs 9999 (3GB RAM variant). To recall, the phone was launched with a starting price of Rs 11,999 for the same variant. Along with the discounted price, the handset also attracts no-cost EMI option, exchange offers and banking discounts. Vivo's Y83 Pro smartphone is also listed with a discounted price of Rs 11,990 as a part of Amazon Fab Phone Fest. The phone was launched with a price tag of Rs 15,990. The customers looking to purchase this Vivo smartphone can also avail cashback of Rs 1000 as Amazon Pay Balance as well as 5 percent cashback on EMI transactions. The phone also brings exchange discount of up to Rs 10,791 as well as no-cost EMI option. Xiaomi Redmi Note 7 Pro, Redmi Note 7 Smartphones to Go on Sale Today at Flipkart, Amazon India & Mi Stores. Moreover, the Huawei Y9 smartphone which was introduced in the Indian market earlier this year, too has received a price cut. As per the ongoing sale, the phone is listed with a discount of Rs 1000 that brings the original price of the smartphone i.e. Rs 15,990 down to Rs 14,990. The handset also brings No-cost EMI, 5 percent cashback on SBI credit card transactions along with exchange discount of up to Rs 13,000. The company is also offering discounts and exchange benefits on devices such as OnePlus 6T, Xiaomi Mi A2, Oppo F11 Pro and Vivo V15 Pro and several other phones. Moreover, this sale from Amazon also brings accessories like car chargers, headphones, power banks and cases at an attractive price point.